If you can, try and follow these guidelines to get a good quality photo for a portrait. Phone cameras are great, if you know how to use them well. I find it useful to receive a selection of photos so i can select the best shot for producing your portrait. If there are multiple subjects in the portrait I can work from several photos – you don’t need to get all subjects in the same photo but you do need the lighting to be from the same direction. You will need good lighting – It is better to take photos outside but if you have no choice but to take a photo indoors choose a window with lots of light. I can lighten your photos on my computer to see more details so don’t worry if they are a little dark. Get down to the subjects level at head height for the best angle. Often a photo that isn’t a particularly good composition but with the right pose and quality makes the perfect portrait. If you need to hold your pet in position using a lead or collar I will most probably be able to crop this out of the painting. A photo taken looking down on a dog is generally not a good shot – although it does work sometimes. If your loved one has passed on please don’t worry – send me the photos you have and I will work with you to get the best portrait I can. Sometimes I can combine features from different photos..
You will need the photographers written permission to use these photos as the photographer owns the copyright. However, often these are not the best photos for portraits – if you are unsure send you photos to me and I can advise. You can get a great photo with the latest mobile smart phones as long as you take the photos outdoors and don’t use the zoom feature. 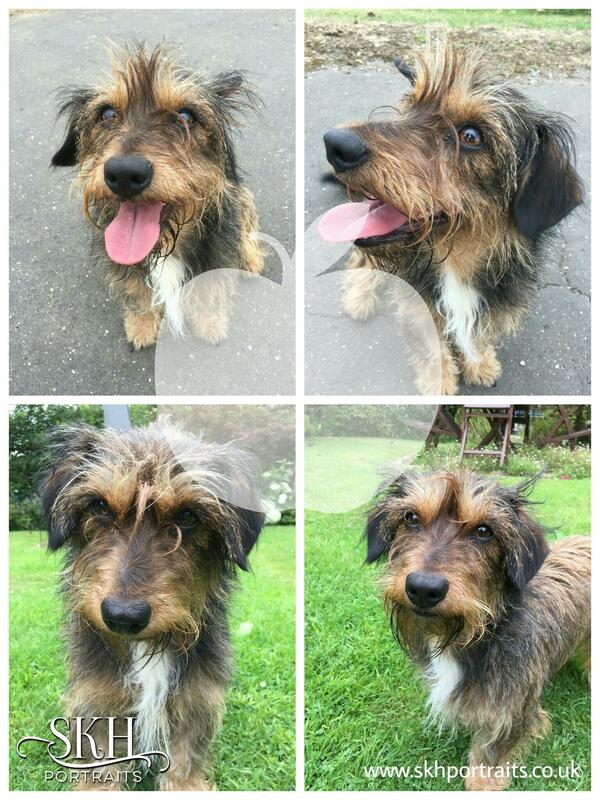 Here are some superb photos from one of my customers of little Tilly the Daschund Cross. They were taken on a smart phone. The important things to note: Tilly’s mummy Kate got down low to Tilly’s eye height. she didn’t zoom and she went as close as she could to fill the lense / screen with Tilly’s beautiful face. Most importantly she went outside to get good lighting. Mobile phone camera’s work best outside.